July was a huge reading month for me! I was on vacation so I had a lot of time to catch up on books I had bought on my kindle a while ago but never actually got around to reading. Anna and the French Kiss was a reread for me, and it was just as a cute and adorable and lovely read as it was the first time around. I reread this book while in Paris. In the novel, Anna is sent off to boarding school in Paris for her senior year. Throughout the book, she travels all around the city. While rereading, I wrote down all the different places that Anna visits and decided that I wanted to capture her tour on film for all to see! You can see my tour here. Royally Lost was a so-so read. I did not like the main character at all, though, so that made it hard to get through. The love interest was sweet but still definitely not a favorite. The love was also very instant, which made it hard to believe. I enjoyed Jesse’s Girl a lot. I loved how Maya and Jesse’s relationship developed and that it didn’t turn into instant love. They had real chemistry, and I loved their romance. Even though Maya ends up dating a country star, they had a very believable relationship. A great part of this book was Maya’s family. I loved how supportive they were of Maya and each other. Plus, it was great seeing an update of Sam and Jordan. Another part I liked was how strong-willed Maya was. She knows what she wants, and she’s going to work hard to get there. This book was very sweet and adorable. I absolutely loved To All the Boys I’ve Loved Before and PS I Still Love You. This duology quickly made its way onto favorite contemporaries list. I read the sequel right after finishing the first book so it felt like reading one long book. Both are both so adorable and charming, and I was definitely swooning over the romances. 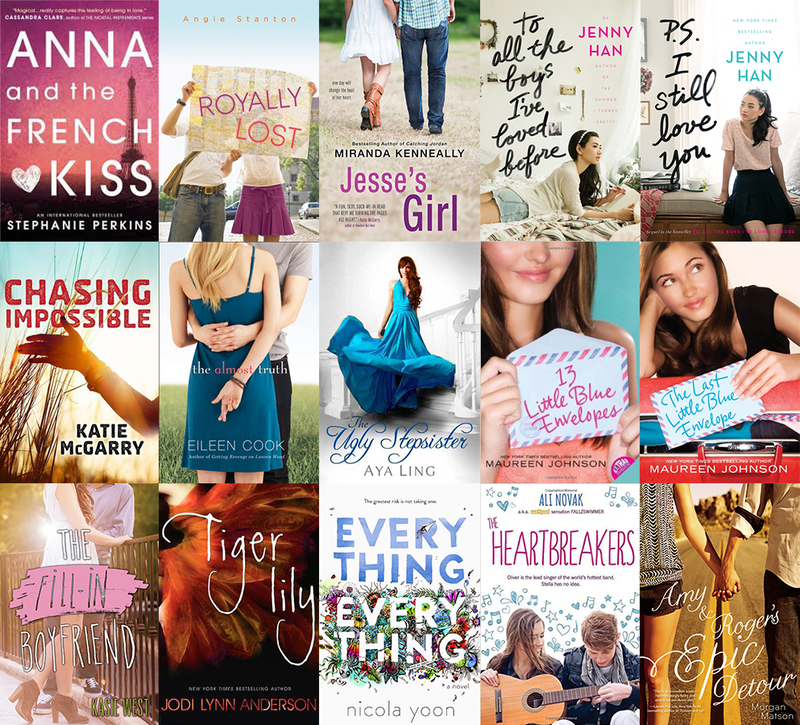 I highly recommend these books for someone looking for a cute romance. One thing I love about Katie McGarry’s writing is that she never takes the easy way out. Her characters always have real consequences for the choices they make. The happily ever after doesn’t just come to them; they have to work hard for it. This is very true for Chasing Impossible. Logan and Abby’s romance is a good one, but that is just a part of the book. The story focuses on discovering who each of them are as a person. It’s about living with the choices you make and the consequences that come with them. It’s about moving on from the past to try to have a better future. It’s about deicing who you want to be and how you’ll work to get there. Full review here. The Almost Truth was an okay read. I guessed the plot line right away, and I didn’t really enjoy the romance at all. I wouldn’t reread this book or recommend it. At first, it was slow getting into The Ugly Stepsister, but I liked it a lot once it picked up. I love that this wasn’t just a Cinderella retelling—it’s twist made it different. Instead of our protagonist being Cinderella herself, she is one of the ugly stepsisters. Kat is pulled into the story when she accidentally ruins the book. To return home to her family, Kat must complete the happily ever after and get Cinderella her prince charming. However, while Kat tries to get Cinderella and the prince together, the prince ends up falling for Kat. This book was an enjoyable read. Full review here. I’ve heard a lot about 13 Little Blue Envelopes over the years, and I was excited to read it. However, the book did not live up to my expectations and I was disappointed by it. I had already bought the sequel on my kindle so I read it. The Last Little Blue Envelope was much better than the first one, but it still lacked something. I wouldn’t reread them. Tiger Lily is a prequel/retelling of Peter Pan from Tinker’s point of view about Tiger Lily, and I absolutely loved it. The book was well written, and I ended up reading through it very fast. The story was both wonderful and heartbreaking at the same time—heartbreakingly wonderful if you would. I absolutely recommend this read, and I hope more people read this. The Fill-in Boyfriend was a cute read. I really do love the fake boyfriend turns into love interest trope and this did not disappoint. I really did like the romance between Gia and Hayden—super cute and fluffy. I didn’t like Gia’s friends or how they treated each other. I was glad that Gia found a better friend and that she realized her mistakes in the end. Overall, a very light, fluffy, and quick read. I wasn’t planning on reading Everything, Everything in one sitting. I decided to just read a couple chapters before continuing on with my day. Soon enough a couple chapters turned into a few, and then those few turned into several. I just did not want to put the book down. Needless to say, I ended up finishing the book that very same day. The story unfolds through diary entries, emails, charts, lists, and drawings. These illustrations made the story entertaining, charming, and personal, and I absolutely loved this aspect of the novel. I enjoyed this novel very much and definitely recommend this book. Full review here. The Heartbreakers was a cute, fun, and quirky read—perfect for summer! Two main themes in the story were of family and friendship. I especially loved the relationship between the three siblings. Stella, Drew, and Cara were always there for each other, whether that was hanging out in the hospital with Cara every day or pushing Stella to take her dream job and focus on a photography career. Stella’s relationship with The Heartbreakers was just so much fun. All the pranks and antics they get up to make it a really enjoyable read. Full review here. Amy & Roger’s Epic Detour was written wonderfully. I loved how Morgan Matson included travel logs, playlists, and even photos from her own road trip throughout the book. This read definitely surpassed my expectations. I thought I was going to be reading a light contemporary, but instead I got a book about grief, guilt, and moving on. I really enjoyed how flashbacks were included to help unfold the story. I was tearing up (very close to crying) when the final, major flashback came along. I definitely recommend this book.